You don’t have to leave your dog home alone anymore. Your dog will meet new friends, socialize with old buddies and enjoy the attention from our trained and loving Camp Counselors. Our 1200 sq. ft. indoor with 5 Separate outdoor play areas and an in-ground shallow pool keeps our campers active regardless of weather conditions. 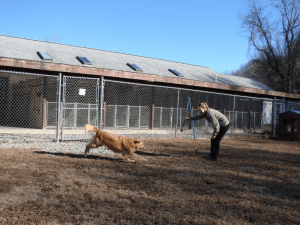 Want to see what your dog is up to in camp? Watch them play outdoors at your home or office with our outdoor web cam. Safe and convenient way to encourage socialization and fitness. 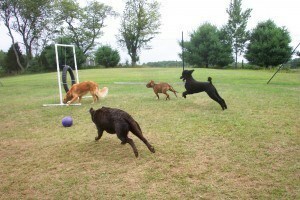 Dogs are happier and healthier when actively engaged and exercised. Reduces the risk of unwanted behaviors like digging, chewing or excessive barking due to boredom or separation anxiety. Burns off pent-up energy, a tired, happy dog can make your arrival home after a long day much easier. Satisfies a dog’s inherent pack nature by being around other dogs, playing and interacting with friends. Builds confidence and gives you peace of mind knowing that your pet is in a safe, fun place! Does your dog prefer the company of people instead of other dogs? We can customize activities throughout the day to meet your pet’s unique needs. Your dog could go on a nature walk, splash in a pool, play fetch, tug-of-war, chase, pit ball and/or enjoy some cuddle time, puzzle time, or story book time. How do you get your dog enrolled? Call us to make an appointment for your first visit. Click Here to download an EVALUATION FORM to complete and bring with you. We will introduce your dog to our facility, our staff and evaluate if Doggy Day Camp or Personal Doggy Day Camp is the best fit. 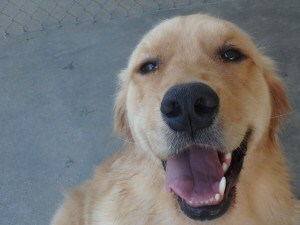 When you pick your dog up we will give a report of how your dog played, interacted with our staff and any new friends.